Win the battle with vertigo through specialized testing. For more than a decade, Tamera Dillen’s teaching career was on the rise. She had successfully climbed the educational ladder, eventually making the leap from paraprofessional to full-time high school teacher. Then, one night last fall, everything in her world began to fall down around her. Audiologist Dr. Lisa Krebs (right) conducts a VNG test. At least, that’s how it seemed. The problem persisted through what proved to be a mostly sleepless night and into the next morning. That’s when a frightened and bewildered Tamera called her daughter and asked her to take her to the emergency room, where she was eventually admitted for what proved to be a two-day hospital stay. During Tamera’s hospital stay, doctors first performed an MRI and a CT scan. That eliminated a brain tumor or some kind of brain trauma as the cause of her dizziness and nausea. Doctors then ran a series of tests and discovered the problem was actually the result of vestibular nerve damage and that she was suffering from vertigo. As a result of their findings, the doctors at the hospital referred Tamera to the vertigo specialists at Atlantic Ear, Nose and Throat. At Atlantic ENT, the doctors take a team approach that starts with the patient seeing a physician’s assistant who has been trained specifically in treating patients with vertigo. “After that, one of our audiologists performs a vestibular nystagmogram, or VNG,” explains Devang Shah, MD. “That is a test that records the motion of the eye as different stimuli are applied to the balance organ. 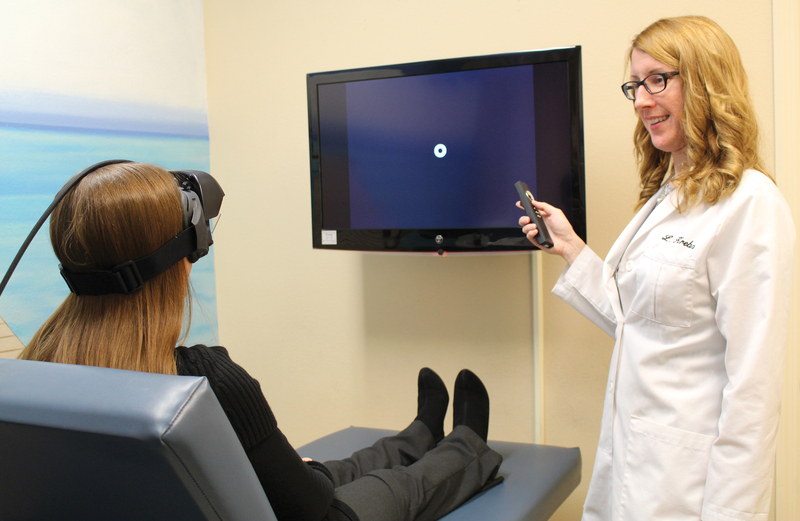 “We try to put the patient in different head positions to see how the eyes react, and we put warm and cold air in the ear canal, which also stimulates the balance organ and allows us to measure the response to that. The VNG given to Tamera showed that she was suffering from unilateral vestibular hypofunction, a condition in which the balance system in the inner ear, the peripheral vestibular system, is not working properly. There is a vestibular system in both ears, so unilateral means only one system is impaired, while the other is working normally. In Tamera’s case, Dr. Shah and his team determined that it was indeed the right balance organ that was damaged and causing the vertigo. Tamera’s vertigo was severe, but in patients suffering from unilateral vestibular hypofunction, the vertigo can be mild and can actually disappear on its own after a few days or weeks. That was not the case with Tamera. Two weeks after leaving the hospital she was still experiencing many of the symptoms associated with unilateral vestibular hypofunction. She was still suffering from vertigo, poor balance and blurred vision and was having trouble walking either outside or in darkened rooms. Tamera was clearly suffering from an acute case of unilateral vestibular hypofunction, so the next step the doctors at Atlantic ENT took was to refer her to a physical therapist who specializes in training patients to compensate for the effects caused by the damage done to the balance organ. Tamera only missed a week of work as a result of her vertigo, but for a month, she had to catch a ride to work from another teacher who lived nearby because she was prohibited from driving. Walking remained an issue for a while as well. It wasn’t until after a couple of weeks of balance retraining that Tamera was able to walk normally again. During her therapy sessions, Tamera was asked to do a variety of exercises that are designed to retrain the body to balance itself. Among them are a series of eye exercises and simple walking exercises that are eventually combined in a way that allows the patient to regain their balance and live normally again. Now several months removed from her balance retraining, Tamera says she is just about back to being her old self. She still has the occasional dizzy spell, she reports, but they pass quickly. She also struggles at times to walk in the dark or while looking off into the distance when outside. Other than that, she says, she’s fine.